Don Victor is 54-years-old living in Casa Eva, our home for the orphaned and abandoned elderly. Unlike the other abuelos in NPH’s care, Don Victor is here temporarily, under the care of the main nurse Maria Nelly until he recuperates and can return to live with his daughter. During his work as a bricklayer, he was electrocuted on the job, paralyzing him from the waist down. Based on his condition the local doctors decided to perform a colostomy on Don Victor. After the accident, he spent his time in the public hospital in Tegucigalpa, Hospital Escuela, for care. After being discharged from Hospital Escuela, Don Victor went to live with his daughter. She lived in Colonia Flor del Campo, a neighborhood in Tegucigalpa that the local newspaper El Heraldo deems the “second most unsafe neighborhood in the city”. A plethora of criminal acts make it an almost ungovernable area. At the time of Don Victor’s injury, his daughter was not only struggling financially but she was single and pregnant, preventing her from lifting Don Victor and keeping him mobile. Soon he started developing pressure sores on his ankles, knees, and back. The level of care that Don Victor required with his paralysis, colostomy and pressure ulcers was to much for his daughter to handle. When he came to NPH, the pressure sores on his back where in such bad condition one could see bone. 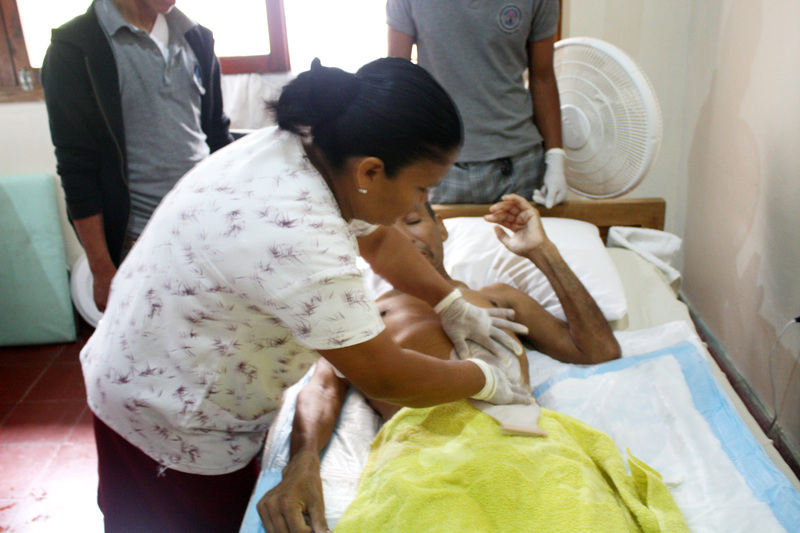 Because his condition was worsening, Don Victor’s cousin came to NPH asking for assistance. Since coming here in March, Don Victors pressure ulcers have shown great improvement thanks to good wound care and a stringent turning schedule. The main nurse Maria Nelly does dressing changes for him two times a week and he receives physical therapy from a university student and volunteer physical therapists here on the premises. In addition, thanks to a very generous donation from Friends of Ostomates Worldwide (FOW) he is now using much higher quality colostomy supplies. These supplies are helping with his skin integrity at and around the ostomy site as well as helping to prevent his pressure sores from becoming infected. The supplies are much less labor intensive and easier to use. Don Victor hopes to recuperate as soon as possible to get back to his family and the nurse would like to see his progress improve so that he can return home in December of this year.